I don’t know what to title this blog post, maybe it’s “All About Details” maybe it’s “The Small Things Matter”, maybe it’s about empowering employees to be awesome. I don’t know. On a recent trip to Disney World with my family I saw some Disney janitorial employees doing something that caught my eye. (Notice the ground in front of them. These employee’s job is to sweep up the trash people leave on the ground around the park. This would seem to be the lowest of the low jobs. A job no one takes pride in, the least creative position in the park. But there they were, with broom in hand, drawing Disney characters on the ground. I walked up to them and the conversation went something like this. So I thought I’d share this little experience, glean what you want from this blog post, it was interesting to me from many different angles. Side Note: I found the below write-up in an HR research paper. 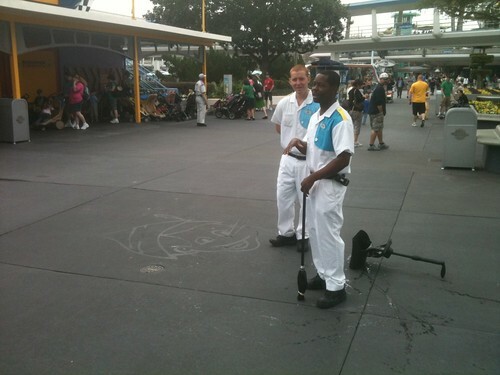 What is the job of a sweeper at a Disney theme park? Most people will ask one of the more anonymous workers at the park, such as a restaurant worker, shopkeeper, clerk or the “sweepers” who clean the grounds. Disney is world-famous for the investments that it makes in training its employees, and for its philosophy that all employees are “characters” on the stage of the theme park. Few realize, that this also extends to the anonymous employees, the sweepers and their type. It is easy to see how the people playing major characters or the performers in the shows fit this vision, but how does a “sweeper” become a “character” essential to the strategic vision of the park? The key is in the fact that park visitors interact with “sweepers” when they need information. One often hears patrons say, “I couldn’t believe how knowledgeable and friendly the groundskeeper was. S/he was eager to answer our question, and was very well informed. Even though it wasn’t part of their job, they took the time to really help us.” In fact, such helping is a key part of the job of “sweepers” at Disney. Traditionally, organizations define jobs by focusing on the specific tasks of the worker. Thus, a “sweeper” is defined as someone who sweeps, picks up trash, etc. Based on this logic, one would hire sweepers for minimal skills in cleaning, recruit from among those who are willing to work for the minimum wage, and provide only basic training in the use of equipment. Rewards would probably be based on time on the job and, at best, performance would be evaluated by such things as reliable attendance, and perhaps the cleanliness of the person’s assigned territory in the park. At Disney, “sweepers” are selected, trained and rewarded for their friendliness and courtesy to customers, and their ability to provide useful information when asked. It is no accident that patrons at Disney theme parks have such good experiences with the “anonymous” workers in the park, because Disney recognizes the critical behaviors and “moments of truth” that make a park visit a customer’s delight. Of course the attractions, shows and characters must be excellent, but in many ways these things can be copied by others. So, it is also critical that the “sweepers” and others like them “perform” excellently when they come in contact with customers. Other theme parks miss this critical point, and continue to define the job of “sweeper” merely in terms of sweeping, so it should be no surprise that Disney can achieve a competitive advantage. Notice how differently one would approach the measurement of the impact of human resources “sweepers” in the Disney framework. Even investments in sweepers are measured according to their impact on the delight of theme park customers.